We’ve been treating a lot of new mothers in recent weeks, who’ve come to us complaining of pain and swelling on the thumb-side of the wrist, and difficulty extending their thumbs. This causes them a lot of discomfort when performing daily tasks like lifting baby etc. Exceedingly common and easily identified, it is easy to understand why this condition called De Quervain’s Tendonitis, also has the nickname of ‘Mommy Thumb’. As many 50% of new mothers experience this condition, but this condition also commonly occurs in many people who engage in activities with repetitive hand or wrist movements, such as gardening, knitting, cooking, playing a musical instrument, carpentry, walking a pet on a leash, lifting a baby, etc. WHAT IS De QUERVAIN’S TENDONITIS ? De Quervain’s tendonitis involves thumb extensor tendons that run through a canal at the base of the thumb at the back of the hand. Specifically, the protective synovial sheath of the tendon becomes inflamed. In most cases, the condition is not serious and can be easily treated. When you grip, grasp, clench, pinch or wring anything in your hand, you use two major tendons in your wrist and lower thumb. 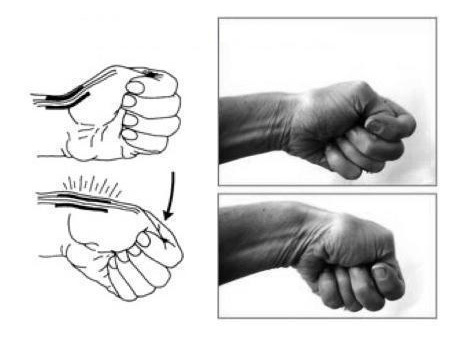 These tendons run side-by-side from your forearm through the thumb side of your wrist. They normally glide unhampered through the small tunnel that connects them to the base of the thumb. 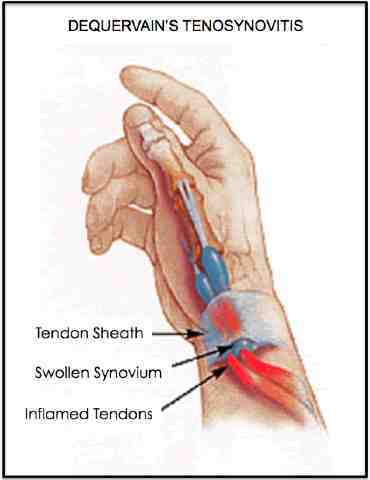 In De Quervain’s tendonitis (sometimes also called tenosynovitis), the tendons’ protective gliding sheath (covering) becomes inflamed, restricting movement of the tendons. It is this inflammation of the tendon sheath that must be treated. Office work: Repetitive work tasks such as typing, lifting, organising files, etc. In short, ‘Mommy Thumb’ is due to overuse of the wrist and thumb (by repetitive movements) while performing activities of daily living (ADL). Because up to 50% of the hand’s function requires involvement of the thumb, overuse injury can significantly hamper everyday functions. The most common cause of ‘Mommy Thumb‘ occurs when infants are lifted with improper technique. Many mothers reach down and place their thumbs in their child’s armpits to lift them. This causes extra strain on the thumb and its tendons. A mother will describe it as a sharp, shooting pain starting at the thumb, through the wrist, and darting up the forearm. This improper lifting affects up to 50% of new mothers, who are their infant’s primary caregivers. Naturally, the heavier the child is, the more likely this condition will occur. Also, repeatedly lifting a child from a lower position (e.g. from the ground or a low crib) further increases the risk of this condition. The repetitive motion of placing the thumb and index finger in the shape of an “L” to lift young children causes the pain and inflammation. Similarly, cradling the child with the L-shaped thumb and index finger beneath its head can also cause discomfort, as can other awkward hand positions while carrying a baby. While this condition can affect any mother, research suggests that mothers over the age of 40 are at increased risk for developing ‘Mommy Thumb’, and there are several possible reasons for this; women are having children at a later age, and generally newborn babies weigh up to 10% more than they did 30 years ago; crib heights are lower (therefore requiring mothers to bend over to lift the child up, with awkward wrist positioning); many new mothers also use a Blackberry and other devices for frequent text messaging. Lastly, hormonal changes associated with nursing and pregnancy can contribute to tendon swelling and weaker thumb and wrist function. Mommy thumb can be avoided by modifying your lifting technique. When picking up your child, do not use your thumb and fingers. Instead, place your hands on both sides of their rib cage and gently squeeze the child to lift. Alternatively, place one hand under the child’s bottom and one behind their head to lift the child. Make sure you aren’t bending down farther than necessary. Remember to bend your knees and use your legs to lift heavier children, to avoid bending the back or stooping over while lifting your child. WHAT ARE THE SYMPTOMS of De QUERVAINS’S TENDONITIS ? A snapping or catching feeling when moving the thumb, much like a trigger finger. Besides a review of possible aggravating activities, the most common diagnostic procedure is the Finkelstein Maneuver. You can try this test at home. Make a fist with the fingers placed over the thumb (the thumb is tucked in and bent towards the little finger; see photograph). You may feel tenderness at the base of, or over the thumb, or even a swelling or thickening. You may also bend your fist downward to further test for discomfort. A common finding with this test is the tenderness or pain felt over the thumb, which confirms tendonitis. Occasionally the pain may shoot (radiate) up the forearm. The primary goal is to relieve the ache that is caused by the inflammation of the tendon sheath that the tendons pass through. Return to normal function usually occurs within 2-4 weeks. Most approaches are non-surgical, with surgery reserved for severe cases and those that don’t respond to non-surgical measures. Activity Modification: Limit and avoid activities that may directly aggravate thumb and wrist discomfort. Wear a wrist brace or splint: These are specially molded to protect and limit thumb and wrist movement. Apply ice or cold packs: Applied for 5-15 minutes to affected hand several times a day can help relieve discomfort. Do rehabilitation exercises such as wrist extension and flexion stretch, and supination and pronation of the affected forearm only if these do not cause further discomfort or pain. Non-steroidal anti-inflammatory drugs (NSAIDs) such as aspirin, ibuprofen, naproxen or the newer COX-2 inhibitors (Celebrex/Arcoxia). Use in consultation with your doctor as prolonged use can cause gastrointestinal problems, ulcers, heartburn, etc. Cortisone injections: A cortisone-type injection can be administed by your doctor into the tendon compartment to rapidly reduce the tendon swelling (tendonitis). This may be used alone or in combination with other non-surgical treatments. This treatment should not be used more than twice to avoid any adverse effects that may occur with chronic steroid use. Surgery (compartment release): When symptoms are severe or do not improve, Surgery may be recommended. The surgery opens the compartment to make more room for the inflamed tendons, which breaks the cycle that occurs when the tight space causes repeated inflammation. The operation is performed through only a small incision, under local anesthesia and usually takes less than 20 minutes, usually as a Day-Surgery procedure. Pain relief is rapid and normal use of the hand is often restored in 1 to 3 weeks. The results of surgery are permanent and recurrence of the condition is rare. De Quervain’s Tendonitis or ‘Mommy Thumb’ is a very common condition and in fact is very easily treated. Most mothers we’ve treated manage very well with non-surgical treatments, and as baby grows up in the first year and starts to crawl or walk, many of the aggravating factors are removed. During this period, proper advice and protection with splinting may be all that is required. Early treatment and intervention improves results. So don’t suffer in pain. Consult your doctor today. To see if you have this condition, or what we can do to help relieve your wrist pain, contact our Specialist Hand Surgeon, Dr. Jonathan Y. Lee for a consultation at +65 6440 1200 or +65 6440 737 1100.